I’ll preface this one by admitting that it’s a tad rich for my blood. Which probably puts it right in most people’s wheelhouse since I have a low tolerance for that kind of thing. 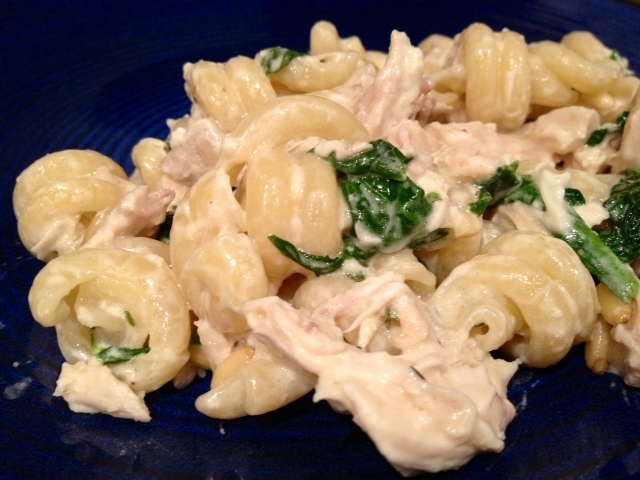 But the combination of flavorful rotisserie chicken, garlicky chicken, and creamy goat cheese really packs a wallop. 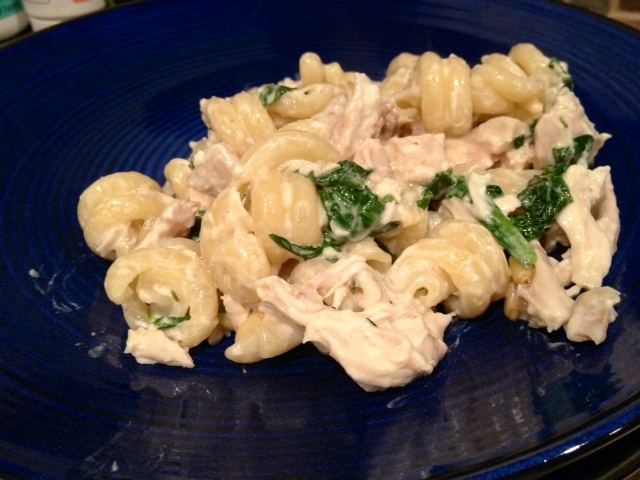 This is another of my infamous “kitchen sink” pastas, which have a pretty doggone good track record over the years. There seem to be some really odd but delicious combinations of random pasta-friendly ingredients sitting around my house when I’m hungry. This one, while not my favorite ever, was warm and comforting—it would have been a great winter dish. And for someone with a taste for these things, a dash of spice (like red pepper flakes or something along those lines) would add an interesting bite to the creamy richness. Put the pasta water on to boil, then add a handful of salt when it’s boiling. Add the pasta and cook until al dente. 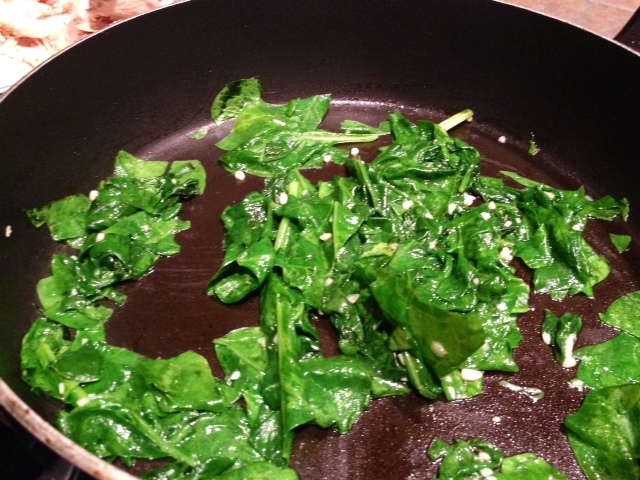 Throw a few handfuls of spinach in a skillet with a couple tablespoons of olive oil. Add a clove or two of minced garlic, and season with salt and pepper. Saute for a few minutes, until the spinach becomes soft and wilted. In a different skillet, heat a couple tablespoons of oil and toss in the cooked chicken, just to get it nice and warmed up. 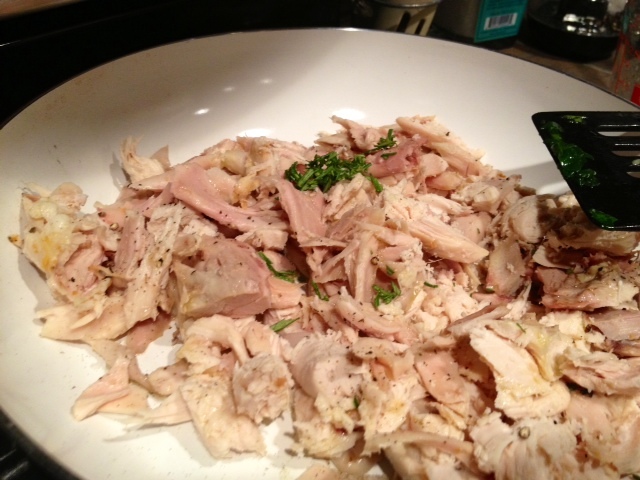 I used rotisserie chicken and seasoned it with salt and pepper, along with some chopped-up rosemary. Smelled so good! For a little extra fancy, toast the pine nuts for a minute (just a minute—they burn!) in a tiny pan. 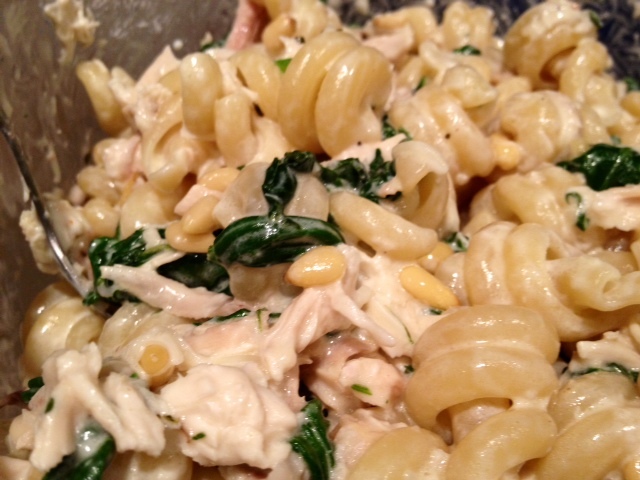 While your pasta is boiling, place the cooked spinach, chicken, pine nuts, and goat cheese in a giant bowl. Keep back about a half cup to cup of the pasta water, then drain the pasta and toss with all the delicious things. Drizzle in the reserved pasta water as needed, to make the goat cheese all creamy and saucy. While it was a little rich for me to make all the time, the flavors were perfect for each other, and I liked the heavy garlic flavor. I used to cook with tons of garlic all the time, but my diet has been a little light on it recently—felt like old times! While the pasta is cooking, throw a few handfuls of spinach in a skillet with a couple tablespoons of olive oil. Add a clove or two of minced garlic, and season with salt and pepper. Saute for a few minutes, until the spinach becomes soft and wilted. In a different skillet, heat a couple tablespoons of oil and toss in the cooked chicken (you’re just getting it warmed up and seasoned). ken and seasoned it with salt and pepper, along with some chopped-up rosemary. 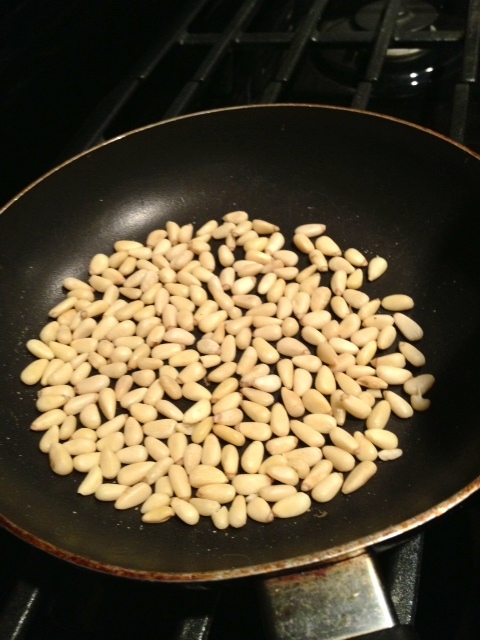 Toast the pine nuts for a minute in a pan or toaster oven. You can skip this step if you’re feeling lazy. 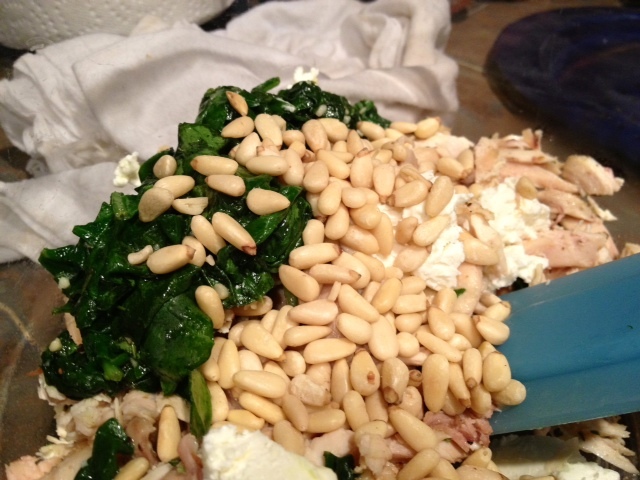 Throw the cooked spinach, chicken, pine nuts, and goat cheese (broken up into pieces) in a giant bowl. Before draining the pasta, reserve about a half cup or maybe a cup of the pasta water. Then drain the pasta and toss with everything in the bowl, drizzling in the reserved pasta water as needed to make the goat cheese all creamy and saucy. Serve hot, with bread and other delicious things!